Nominated for two 1997 VFX HQ Awards: Best Models/Miniatures and Best Miniature Pyrotechnics. Linda Hamilton and Pierce Brosnan star in Roger Donaldson's latest film about an Idaho volcano ready to burst. The exciting and entertaining film features dazzling visual effects supervised by Digital Domain's Pat McClung. In this shot, one of the most complex in the movie, Brosnan and company run away from a wall of a cabin that is destroyed by a sea of lava. 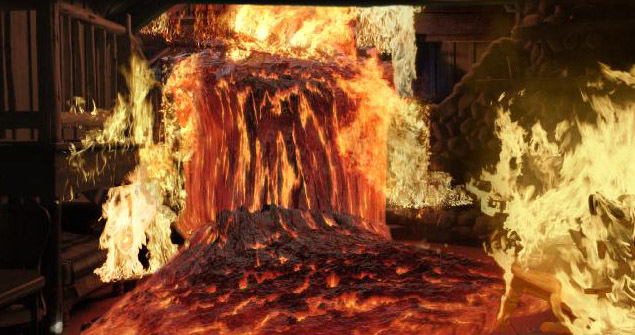 Dozens of elements make up this shot, including CG lava, numerous flame elements, and the back wall, which is actually a full-scale replica that was constructed at Digital Domain. The film effectively uses extensive miniature models to an extent unlike any film since INDEPENDENCE DAY, and features some terrific compositing. About thirty effects shots featured the mountain in a wide shot, usually combined with a camera movement, and the elements fit nicely together. There are about three nighttime shots of the mountain that are truly exceptional. The brightness levels on the mountain perfectly make Dante's Peak fit with the surroundings. The wide shots of the mountain (actually composed of miniatures and matte paintings) are quite believable. The digital compositing team sparkles for DANTE'S PEAK. The still on the left is from a shot taken from a bouncing, fast moving car, and the reality of the shot is spine-tingling. The pyroclastic cloud truly seems as if it is in the distance. 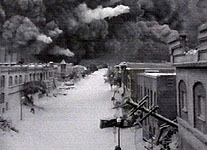 The frame on the right is from a crane shot that begins on a truck zooming past the camera, and cranes up to see the oncoming pyroclastic cloud. Amazing. Many of my favorite shots of the film include the volcano far off in the distance, such as the first shot we see of the ash exploding from the volcano. The camera begins in a building, then follows a character outside. The camera whip pans left to reveal the awesome spectacle of the volcano--all of the elements look great together. Miniatures, along with full-scale explosions were used extensively in the evacuation sequence. Hundreds of cars try to leave the town via the interstate--unfortunately an earthquake stops them in their tracks as the interstate crumbles below them. In one long, wide and absolutely gorgeous shot, we see the concrete highway crumble and collapse, tossing cars off the highway. 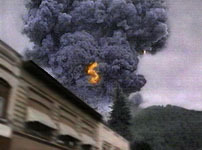 A well-composited explosion element was also added to the shot. A helicopter that tries to fly through the ash storm crashes right in front of Brosnan's truck--everything from the miniature explosion to the camera work to the compositing and pyrotechnics helped make this a memorable sequence, as well. After battling clouds of ash and earthquakes, Brosnan and Hamilton then have to outrun the lava--in a really cool interior shot, a wall collapses and lava flows inside the room. That shot is followed by seven or eight shots in a row including CG lava. Every shot is matched to the live-action plate with terrific accuracy. One of the early shots of the bridge sequence, model miniatures were used quite effectively in the exciting sequences. The bridge sequence caps off with one lone car unable to cross the bridge--closing one of the best miniature disaster sequences in cinema history. 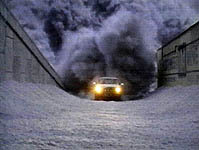 This shot of a car trying to outrun the pyroclastic cloud is reminiscent of last year's CHAIN REACTION (also produced by Digital Domain), where a character's motorcycle outruns the shockwave of an enormous explosion. A great sequence begins as National Guard trucks try to navigate across a perilous bridge, while a dam just broke upstream. The river of debris is matched incredibly well with the truck footage, and the sequence is quite riveting. On a consistent basis, the digital effects shots of DANTE'S PEAK are extremely convincing, even with the background plate jumping all over the place. Just a few exceptions include the first wide shot of the lava spray (a few fire elements were not running at 24 frames/second) and a couple of Linda Hamilton's POV shots (where a semi-transparent reflection element was also running slower than 24 fps). Banned from the Ranch Entertainment created screen graphics for the production, including this screen used by the film's volcanologists to measure the volcano's vibrations. DANTE'S PEAK is so much better than I thought it was going to be. I was expecting another TWISTER--a film with great effects but also included a laughable plot. Director Donaldson has crafted an exciting thriller and has effectively used the visual effects to propel the story instead of using them as a narrative crutch.